Looking for Qatar Business Class flights? We’ve selected the best Qatar business class fares whether it’s for business class to Europe, Asia or the Americas! All fares advertised include taxes, and are currently the best offers from Qatar airways . Qatar business class airfares to subject to availability and changes. If you can not find the fares for the dates required, call or email our Qatar business class specialists and we will find you the best alternatives. To stay on top of your game on the ground, you need the best experience in the air. Qatar’s Business Class cabin combines comfort, spaciousness, and superb service with technology. Fly with them and see for yourself why Qatar was named Airline of the Year and provider of the Best Business Class by Skytrax in 2015. 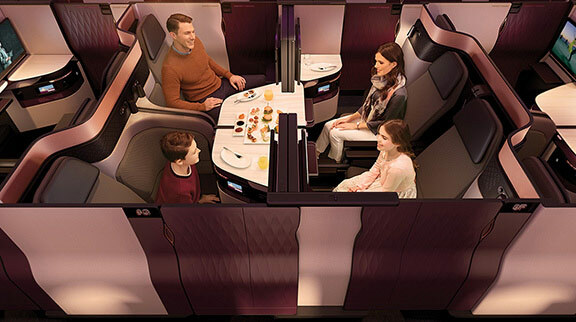 With Qatar Business Class passenger-focused service complements a design based on the passenger’s needs. Feel completely at ease in Qatar’s sophisticated and elegant cabin. The open and spacious design is complemented by award-winning service. Generous storage will keep your belongings within reach, sophisticated LED lighting will help you adjust to changing time zones and an attentive crew will look after all of your needs. Experience the beauty of great design and a high-tech oasis where you can relax, rest and dream with Qatar’s Business Class seat. Settle into unparalleled comfort, and adapt your personal space to suit your needs. Lounge on an ottoman, catch some sleep or make productive use of your time with a large work surface. Your seat also features ample stowage options, a vast selection of in-flight entertainment and a contemporary setting for world-class cuisine. The world is at your fingertips with Qatar Airways’ state-of-the-art communication. Stay connected in Qatar Business Class with OnAir mobile service, laptop power and a USB plug. A large working area and total privacy will enable you to roll up your sleeves and get busy. Wi-Fi services, available onboard Qatar’s A380, A350, B787, A319 and selected A330, A320 and A321 aircraft, make it easy to stay on top of your work with uninterrupted access to colleagues and clients. Watch time fly by with thousands of entertainment options. In Qatar Business Class Oryx Entertainment’s innovative system features an intuitive touch screen to quickly find an array of movies, games and music to suit your taste. With the very first dual-screen interface, onboard all of Qatar’s A350, A380 and B787 aircraft, you will be able to multitask — like play a game on your handheld device as you wait for a movie to load on your personal screen. Take pleasure in signature dishes designed exclusively for Qatar Airways Business Class by two celebrity chefs. In Qatar Business Class an on-demand menu service lets you enjoy sweet or savoury delicacies whenever you like. Unique flavours, beautiful food presentation, luxurious table linen and modern cutlery will please all of your five senses. Qatar offers a wide selection of non-alcoholic beverages at anytime during your journey. Enjoy a tantalising combination of fruity fizz or spicy zest, and savour signature Mocktails designed by celebrity chefs. Relax and unwind with a cappuccino, espresso, a freshly brewed cup of coffee or tea served from an individual porcelain set. In Qatar Business Class attention has been made to every sensory detail. A selection of Giorgio Armani’s finest amenities will revive and refresh you. Fine sleepwear and luxury Italian Frette linen will soften your seat curves. Comfort. Convenience. Choice. These are the things that matter most to today’s traveller, and what you will find at the heart of Hamad International Airport, Qatar Airways’ new home.